In the 2019 Budget, the Federal Government faces a clear choice. It can make decisions that entrench inequalities, that deliver tax cuts to the most wealthy and deplete the revenue needed to fund our hospitals, schools, community services and public infrastructure. Or, it can choose to remove inequitable tax concessions and loopholes and invest in our communities, our public services, and our social safety net. Against this backdrop, we are calling for a Federal Budget that prioritises justice, fairness and solidarity. 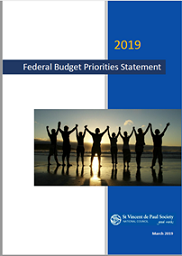 A Budget based on these principles must rebuild and repair the social safety net, invest in education and our health system, and restore funding to essential social programs and services. It must reorient our social security system back towards supporting, rather than punishing, those locked out of the labour market. It must also ensure a more equitable and sustainable tax system that removes unfair tax breaks and loopholes that benefit the wealthy, and secures the revenue needed to fund our health, education and social services.